The human body consists of 50-70% water. Predictably, it would make sense that fluid intake is undoubtedly important, however is often very overlooked by both the athletic and general population. Hydration status can be classified into three states; 1) Euhydrated (hydrated), 2) Hypohydrated (dehydrated) and 3) Hyperhydrated (over-hydrated). The purpose for any hydration strategy is to remain within a euhydrated state as both dehydration and over-hydration can be detrimental to health and performance. To compliment other recommendations within nutrition, more does not equal better. This is often misconstrued as beverages such as water does not have a calorie value, therefore are often consumed without any further thought. Consequently, adverse health conditions can become apparent when large reductions or additions to body water are seen. For example, hot climates combined with large losses in body water can induce heat syncope, heat exhaustion, central fatigue and hypotension. In addition to this, an inability to sweat and cool the body can lead to heat stroke due to the accumulative heat production and core body temperature. This can further progress into dysfunction of the nervous system and can become fatal in sever circumstances. It is generally considered, that being in a 2% dehydrated state can impair exercise performance. Although this specific cut off point is ambiguous and is up for debate, a general trend for impairments in performance is definitely seen as dehydration beyond this point continues. In contrary, over-hydration through excessive consumption of water can lead to an electrolyte deficit. This has a posing threat to health as the diluted blood electrolyte balance; particularly sodium causes a shift of fluid from the extracellular compartment to the intracellular space resulting in cell swelling and impairments to the nervous system. Think of slow marathon runners in hot conditions stopping at every water station – over the course of the 5-6 hour stint, water intake is very high however little to no repletion of electrolytes will occur, thus further depleting the bodies electrolyte balance. This is often referred to hyponatremia (low blood sodium) in the sporting literature. Therefore, the aim of this article is to highlight the importance of fluid intake and provide guidelines with regards to fluid requirements based on exercise demands. As the title would suggest, fluid intake for athletes is simply more than just drinking water, especially if exercise or competition is within close proximity. Before getting into how much fluid is required for the purpose of exercise, we need to address fluid requirements as a whole. Compared to other nutrients, fluid recommendations are difficult to provide due the high degree of variables that influence total body water. Similar to clinical settings, fluid requirements (expressed as AI: Adequate Intake) can be based off calorie requirements. Logically speaking, calorie requirements to maintain normal bodyweight would take it account body size, activity level, gender etc. Since calorie requirements have a large evidence base, obtaining fluid requirements off this can be a fair assumption. In a medical setting, 1ml of fluid is prescribed per 1kcal consumed to patients who have difficulty eating, i.e. tube feeding. Contrary to popular belief, the fluids found within foods and other beverages do count towards your fluid requirements and typically make up 20% of the recommended daily intake. For example, a cooked steak may be 50-59% water, pasta and legumes consist of 60-69% water, where bananas, avocados and baked potatoes may contain 70-79% water. Therefore, a 200g cooked steak may contain 100ml of water – it’s a small amount but will count towards the daily total. Therefore, during periods of weight maintenance, total daily fluid intake can be confidently expressed as milliliters per calorie. Athletes undergoing a fat loss phase where calorie restricted diets are needed; fluid intake should not match this as fluid intake will become unnecessarily low and inadequate. Therefore, to determine your individual fluid intake, you first need to know your calorie requirements. To find out how many calories you need per day, I’ve covered this including how to build your own diet in my latest Nutrition Guide; Build your own diet. It’s completely free to download and is an excellent resource if you’re looking to excel at your sport by taking your nutrition to the next level. Pre training BW = 82kg, Post training BW = 81kg. Difference = 1kg (1kg = 1L). Therefore, we can confidently assume that 1 litre of fluid loss. In addition, the fluid consumed during this session should also be monitored and factored. In this scenario, 0.5 litres of fluid may have been consumed; therefore a total loss of 1.5kg/1.5L should be noted. It’s generally recommended that more fluid is consumed to restore water loss, therefore making the 1:1 ratio during exercise void. In this instance, it is recommended to consume 150% of the fluid loss during exercise. When consuming a low sodium sports drink, it was observed that consuming 150% vs 100% of the fluid loss during exercise enhance rehydration three hours after the exercise session had completed (Mitchel et al, 1994). Knowing this, if 1.5kg of bodyweight is lost during exercise through sweat losses, approx. 2.25 litres of fluid is required for an improved hydration status. Practically speaking, this approach would be most advisable if training or competition is repeated within the same day. i.e. tournaments. The caveat is that this gives you an estimate of your fluid requirements during exercise when the conditions are the same. Such as; the session type, intensity, climate, clothing worn, altitude etc. Therefore this does take some trial and error and I would encourage you to trial this on different types of sessions that replicate your competition demands. I.e. the differential in weight pre and post for a weight session would differ greatly to an 80 minute rugby game. Once changes in body mass have been noted for a variety of different sessions, you’ll then have your hydration strategy when these sessions are repeated. Hypotonic sports drinks have a lower tonicity than blood plasma. Often have very few carbohydrates and are considered to be an electrolyte drink as it’s typically under a 6% solution. Isotonic sports drinks have the same tonicity as blood plasma. Most often found in commercially available sports drinks such as Lucozade Sport, Powerade, and Gatorade and are typically a 6-8% solution that yields approx. 30g of carbohydrates per 500mL. Hypertonic sports drinks have a higher tonicity than blood plasma and are typically a 10% solution offering a higher amount of carbohydrates, approx. 50g per 500mL serving. As each drink plays a different role within hydration and recovery, the tonicity of the beverage will influence hydration status as discussed below. This section is very briefly, simply because there aren’t any definitive recommendations. However, it’s been observed that rapid ingestion of large amounts of water or hypotonic drinks increases blood volume and lowers blood osmolality. In return, causes the fluid balance mechanism; vasopressin to become downregulated – meaning that fluid reabsorption is reduced and urine output becomes higher. To compliment this, it’s been reported that drinking an isotonic sports drink at 150% of fluid loss over a 30 minute vs 90 minute period resulted in greater fluid loss. Furthermore, hydration status is better after an 8 hour period when consuming 100% of fluid loss over four hours instead of one hour (Archer and Shirreffs, 2001. Jones et al, 2010). Despite the lacking research in this area, there is a general trend to spreading out fluid intake over the course of the post exercise period to help retain the fluid ingested. Simply necking a large volume of water will only result in increased rates of urination and an inadequate hydration status. The aim for rehydration is to prevent decreases in blood osmolality as this will further increase urine production. Therefore, it is often recommended to consume solutes such as sodium and/or carbohydrates to the beverage to help increase blood osmolality, in return decreasing urine production and an overall improved body water balance. In this instance, I would recommend drinking 150% of the fluid loss via an isotonic sports drink over a 4-5 hour period. A further caveat, If bodyweight changes pre and post exercise are very low due to, 1) very low sweat rates or, 2) good hydration during, then the urgency for a rapid rehydration strategy is not warranted, simply drink as normal. As previously discussed, consuming something in addition to water will enhance hydration. Drinking water only can dilute blood sodium levels and decrease plasma osmolality; therefore urine output increases in a compensatory manor to maintain the body’s water: sodium balance. Most sports drink and hydration formulas will primarily include varying amounts of sodium, potassium and carbohydrates, where varying amounts will influence rehydration. Sodium is lost in higher concentrations through sweat and is considered to be the main cation in extracellular fluid which largely affects plasma osmolality. Sodium losses via sweat typically range between 20-80mmol/L which emphasizes its importance for sports drinks. Of which, Shirreffs et al (1996) found that rates of rehydration were improved when consuming higher amounts of sodium (23mmol/L vs 61mmol/L) in addition to the 150% of fluid loss. In response to higher sodium intakes, urine output decreases and water balance and hydration status is restored. Therefore, it is suggested that sodium intake in beverages is equal to or higher than what has been lost in sweat (Evans et al, 2017). However, commonly available sports drinks often offer a lower concentration of sodium, approx. 20mmol/L – therefore individuals with very high sweat rates who have a higher urgency for rehydration may warrant additional sodium. That being said, this may become at the expense of potassium losses. Potassium is the main cation for intracellular fluid where losses via sweat are much lower when compared to its extracellular counterpart; sodium. Of which, approx. 4-8mmol/L is typically lost. Unlike sodium, it is unlikely that intracellular potassium will become diluted even with high sweat rates. The addition of potassium to drinks is unclear regarding rehydration in the immediate post exercise period – especially in the heat. However, evidence by Shirreffs et al (2007) found that after a four hour period, potassium containing drinks resulted in eyhydration. Moreover, Perez-Idarraga et al (2010) found similar rates of rehydration with potassium rich drinks such as coconut water when compared to water only. Carbohydrates have continually been demonstrated to enhance exercise performance and glycogen repletion. However, adding certain sugars such as glucose to a beverage will increase the fluids tonicity and influence rates of rehydration. It’s been demonstrated that hypertonic sports drinks, i.e. drinks that have a higher osmolality to blood plasma appear to be superior for rehydration. Interestingly, this causes water to shift from the plasma and into the gut; in return, plasma volume initially decreases to compensate for the higher concentration of solutes. Knowing this can have both positive and negative consequences for an athlete’s hydration strategy. For example, if a cyclist were to consume hypertonic sports drink which caused a shift of water into the intestinal lumen, we can be relatively certain that gastrointestinal distress will happen due to the decrease in gastric emptying. Therefore, consuming a 10% beverage at this time would not be wise as it will most likely impair performance. However, this plays to an athletes advantage post exercise as it will reduce the overall volume of fluid update – resulting in the water balance mechanism; arginine vasopressin to become more active and decrease urine output. Thus, improving water balance. When hydration status is measured two, four and six hours post, hydration was superior in 10% carbohydrate drinks when compared to their lower solute counterparts (Oeterberg et al, 2010, Evans et al, 2009, Evans et al, 2009). Therefore, optimal hydration during exercise would warrant the need for an isotonic drink, where post exercise rehydration would be superior when swapping to a hypertonic drink when consumed at 150% of fluid loss. Milkis proposed to be an excellent rehydrating beverage. Milk offers a similar carbohydrate and sodium concentration as isotonic sports drinks, where the addition of protein and potassium may further enhance rehydration to a similar extent to that of a hypertonic sports drink. In part, due to the increased gut osmolality and the subsequent decrease in gastric emptying and absorption (Sawka et al, 2015, Seery et al 2016). Therefore, posing similar characteristics as a 10% hypertonic sports drink. To further milks excellence post exercise, the protein contained increases muscle protein synthesis which aids with muscle recovery when consumed in the correct dose. Of which, it has been reported to be as little as 240mL of whole milk or 390mL of fat free milk (Eliot ret al, 20016). Athletic performance is usually accompanied with acute dehydration. It was originally thought that all alcohol post exercise should be avoided as it will impair rehydration through increased urinary output. However, more recent data would suggest that the diuretic effects of alcohol are dependent on the starting hydration status of the athlete. For example, athletes in a hydrated state observe less alcohol induced urinary output when compared to their dehydrated counterparts. Furthermore, it is paramount to understand that the dose makes the poison – research conducted by Shirreffs and Maughan found that the upper limit of alcohol intake of hydration is 0.49g/kg/bw, where impairments in hydration were seen at intakes of 0.92g/kg/bw. Therefore, for hydration purposes only, it would be advisable for athlete to consume under 0.49g/kg/bw in the post exercise period when in a euhydrated state (approximately 40g of alcohol or 4 standardised drinks for an 80kg individual). Accompanying research would suggest that the greater the alcohol dose in the post exercise period, the greater the dehydration. Of which, 2% alcohol drinks consumed with the recommended 150% of fluid loss appeared to not impair recovery, where 4% drinks did (Shirreffs and Maughan, 2004. Flores-Salamanca et at, 2014). Conversely, the addition of sodium to beer improves hydration status compared to a standard beer – therefore highlighting the importance of sodium’s role in rehydration Desbrow et al, 2015). As always, a caveat will exist – If dehydration is high, i.e. 2kg loss via sweat through exercise, recommendations of 150% fluid intake would suggest that the athlete to consume 3 litres/under 6 pints of sodium enriched beer. Practically speaking, consuming this volume of alcohol will go beyond the upper recommendations of 0.49g/kg/bw and will adversely affect all areas of recovery, immune function, sleep quality and so on. Henceforth, alcohol can be factored into a rehydration strategy, however should not be the foundation of it. Therefore, it can be recommended to you ensure that post exercise hydration status is adequate through water, electrolyte/carbohydrate drinks first prior to consuming alcohol. Finally, if optimal hydration is a high priority due to the proceeding session or event being in close proximity – Alcohol may or may not affect hydration status, but definitely will affect your subsequent performance and sporting conduct. So far, all of the studies mentioned are in the absence of food. For example, when they’ve been measuring rates of rehydration and recovery, no food was provided as it will interfere with the results as to how well a specific dose of drink would aid hydration status. In a real world setting, this simply won’t be the case as some form of meal will be included during this period. Since mixed meals will contain some fluid, carbohydrates and sodium, would the co-ingestion of the aforementioned recovery drinks be needed? Limited research in this area exists, however some literature does offer a great insight. Maughan et al (1996) provided participants either a mixed meal with water or a sport drink where both groups met the 150% recommended fluid intake. Interestingly, the mixed meal plus water was superior for rehydration during six hour post exercise which could be explained by the meals higher sodium content. Moreover, Ray et al (1998) compared water, sports drink, chicken broth or chicken noodle soup over a two hour period post exercise and found that the liquid based meals offered ability to hydrate. Similarly, this could be attributed to the higher sodium content of these meals. When a standardized meal has been consumed with either water or sports drinks, results are mixed as to whether additional electrolytes are beneficial for hydration status (Evans et al, 2014. Miller et al 2014). Therefore, it can be assumed that simply consuming a carbohydrate rich meal alongside water that totals 150% of the fluid loss should be adequate for hydration following dehydrating exercise. Euhydration is the maintenance of water balance within the body to support normal physiological function where both hypo and hyperhydration can lead to negative consequences to both health and performance. Therefore, the role of the athlete is to remain within a eurhydrated state by managing fluid intake. In this instance, total fluid intake must be considered and is recommended to consume fluid relative to the amount of calories you consume (outlined in the table above). Contrary to hydration folk law, fluid intake other than water counts towards your daily targets and typically makes up 20% of fluid requirements. Therefore, the fluid in food, teas, coffee’s and soft drinks count, however should not make up 100% of your fluid intake due to the higher calorie value and perhaps subsequent health issues. For exercise performance, knowing the volume of fluid loss via sweat is very important when developing your own hydration strategies. As previously discussed, this can be obtained by measuring pre and post exercise bodyweight whilst factoring in the volume of fluid consumed. Compelling evidence would suggest that you consume more fluid and sodium than what was lost in order for rapid rehydration. In this instance, replacing 150% of fluid loss appears to be the gold standard. Many issues concerning water intake only leads to the dilution of plasma sodium which causes the body to increase urine production. In return, results in worse rehydration when compared with water and sodium with the addition of carbohydrates. Therefore, it is advised that an isotonic sports drink such as Lucozade Sport, Gatorade, Powerade etc is consumed during exercise to maintain fluid balance. Post exercise rehydration strategies warrant the need for hypertonic drinks where they contain a greater amount of carbohydrates, therefore increasing their tonicity. As a result, you’ll have reduced rates of gastric emptying and slower absorption. Therefore, this leads to decreased urine output, improved water retention and overall rehydration. It has also been suggested that consuming fluid slowly during the hours after exercise improves water retention when compared to downing the drink in one sitting. The addition of small amounts of alcohol under the dose of 0.49kg/bw when consumed via a 2% beverage does not impair rehydration. Not surprisingly, alcoholic beverages at 4% and higher induced dehydration to a greater extent. Furthermore, alcohol should not make up 100% of your fluid intake as the dose will most likely become excessive if sweat rates are very high. Therefore, this can impair recovery and subsequent performance if in close proximity. For example, consuming 6 pints of beer to compensate for the 2 litres of sweat loss during exercise is far from ideal. Finally, the consumption of water only with a mixed meal post exercise appears to be adequate for rehydration when total fluid intake of the meal reaches the 150% of fluid loss threshold. Most likely, this is attributed to reduced gastric emptying and improved water retention. For the near perfect recovery beverage, milk is fantastic as its composition is similar to that seen in an isotonic drink – however, the addition of protein and potassium creates a hypotonic solution and further improves hydration. In addition to hydration, milk also aids with glycogen replenishment and initiates muscle protein synthesis. In terms of programming, I would suggest focusing on hydration during exercise and ensuring that body mass loss doesn’t decrease too much, therefore places less emphasis on the post rehydration strategy. In this scenario, you can simply switch off after a hard bout of exercise and eat a normal mixed meal and consume fluid gradually at your own pace. For example, if fluid loss during exercise were only 0.5 litres due to having a very structured hydration strategy, the 0.75 litres post exercise can be ingested over time as there is little urgency to replenish a small deficit in body mass. Most likely, this volume of fluid will be consumed via food in your next meal. Furthermore, if the proceeding session or competition isn’t within close proximity, the necessity of rapid rehydration isn’t really important as you’ll eventually consume an adequate amount of fluid. 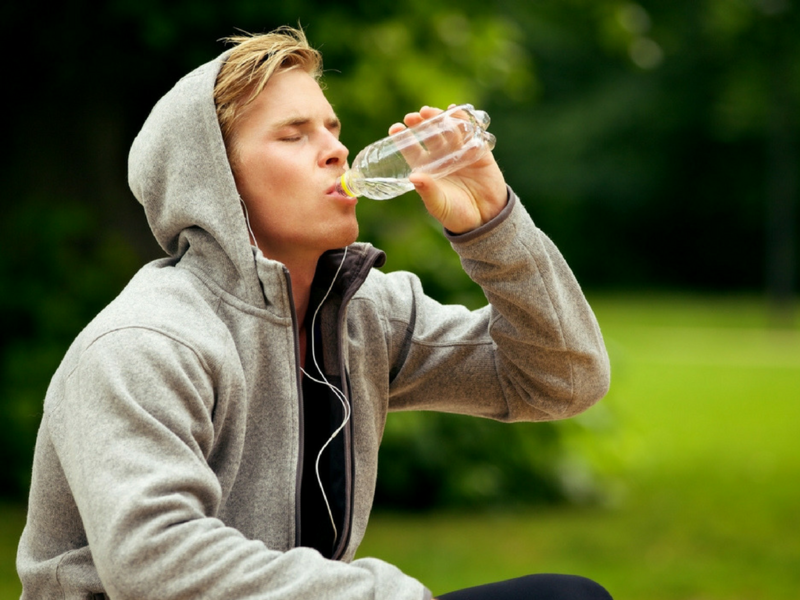 That being said; if it’s difficult to consume adequate fluid during exercise, if the next bout of exercise is within a few hours or if you’re in hot climates where sweat rates are high – then special attention to fluid intake post exercise must a high priority to prevent decrements in health and performance. So, hydration is inexcusably important for health and performance – and it starts with more than just water.